The LASSY word relations web application makes it possible to search for sentences that contain pairs of words between which there is a grammatical relation. 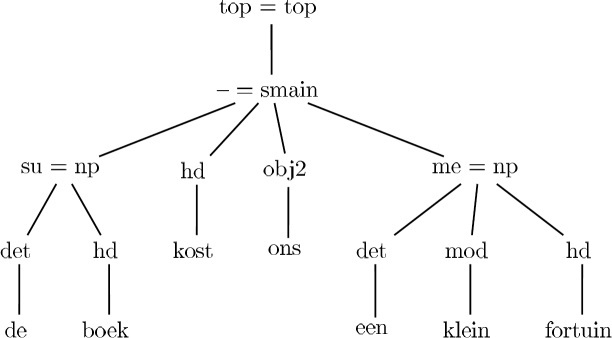 One can search in the Dutch LASSY-SMALL Treebank (1 million tokens), in which the syntactic parse of each sentence has been manually verified, and in (a part of) the LASSY-LARGE Treebank (700 million tokens ),in which the syntactic parse of each sentence has been added by the automatic parser Alpino. One can restrict the query to search for words of a particular Part-of-Speech, which is very useful in the case of syntactic ambiguities. One can also leave out the string of the word, so that one can obtain e.g. a list of sentences in which any adverb modifies a given verb, or even any word modifies a given verb. On the page that lists the found sentences one can view the exact syntactic structure of each sentence by a simple click. The application also provides detailed frequency information of all found sentences and word pairs. The Lassy treebanks have been made by the KU Leuven and the Rijksuniversiteit Groningen through financing of the Dutch Language Union. One can obtain these treebanks through the HLT Agency (TST-Centrale). Use PaQu (http://dev.clarin.nl/node/4182) if you want to search for word pairs in your own text corpus.